We investigated the influences of “reproductive priming”, using acoustic stimuli alone or a combination of acoustic and visual stimuli on egg-laying in female zebra finches (Taeniopygia guttata). One group of females was exposed during 6 days to both acoustic and visual stimuli from males while another was exposed only to acoustic stimuli; a control group was unable to see or hear males prior to the introduction of unfamiliar males for pairing. We also manipulated the amount of visual stimulation by presenting either: males with normal red bands, males with red bands without ultraviolet reflection or unadorned males. Females exposed to visual stimuli spent more time on perches near males than control females or those only hearing males. However, there were no statistically significant differences in subsequent total eggs produced, or the latency to egg-laying between females exposed to priming males with different visual characteristics; they did not significantly differ from the control females in these parameters either. Females that heard, but did not see, priming stimuli produced more eggs when paired with males than the controls. Thus, acoustic stimuli alone may have promoted reproductive condition while the acoustic and visual stimuli together did not. Our results contradict a previous report, and may reflect components of the experimental design we employed (i.e. 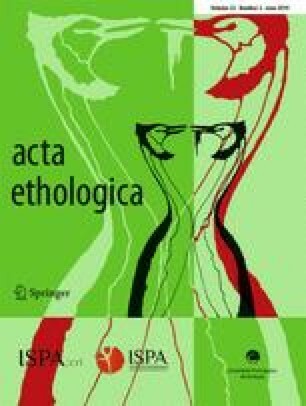 by pairing females with unfamiliar males after their initial exposure to priming males, we may have suppressed their ability to advance their reproductive state). Females that only heard priming males may have been more willing to accept pairing males because of the absence of visual identifiers. We thank R. Minasaki, P. Cuming, Y. -Y. Chau, M. Auger, B. Jones, M. Collinson, P. Meharry, D. Morgan, C. Hill, D. Bell and M. Miyazaki for practical help. We are also grateful toW. Forstmeier, L. Molles, I. Jameson, the associate editor, P. Gama Mota and two anonymous referees whose comments improved our manuscript. The Department of Biological Sciences, University of Waikato, provided generous support. We declare that experiments in this study complied with the current laws of New Zealand. The University of Waikato Animal Ethics Committee approved our experimental protocol.